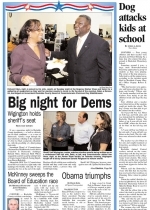 NOVEMBER 5--While Barack Obama's victory in yesterday's presidential election is the lead story in newspapers worldwide, a Georgia daily relegated coverage of the Democrat's historic win beneath stories about a Rottweiler attack and the local sheriff's successful reelection bid. 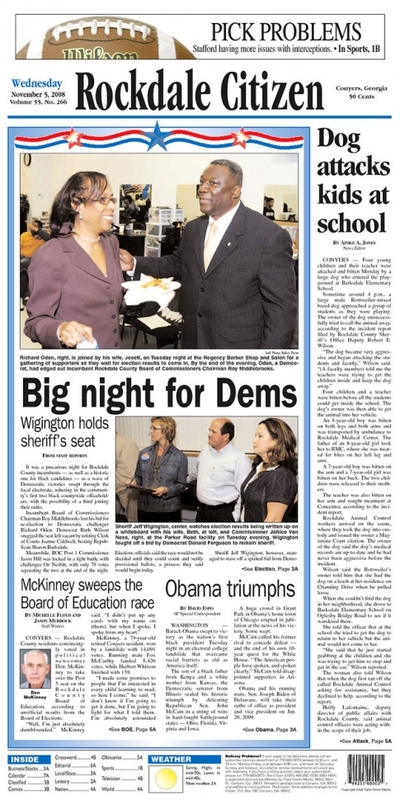 As seen here, the Rockdale Citizen's 'Obama triumphs' headline landed below the fold in the broadsheet, which is headquartered in Conyers, Georgia, an Atlanta suburb. The paper's lead story detailed how four children and a teacher were bitten Monday by a large black 'Rottweiler-mixed breed dog' who attacked the victims in the playground at Barksdale Elementary School. The dog, pictured at right, is currently being held at Rockdale County's Animal Care and Control facility.